From June through November of 2013, Exploration Vessel Nautilus will explore the Gulf of Mexico and the Caribbean Sea. The rotating Corps of Exploration aboard EV Nautilus will be mapping the geological, biological, archaeological and chemical aspects of these regions to depths of approximately 2,000 metres. 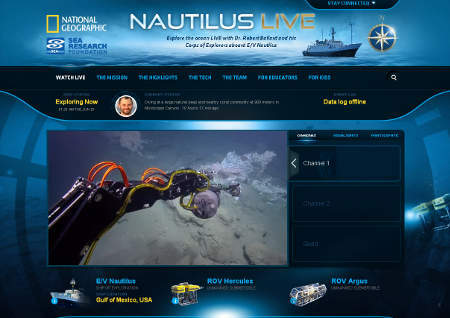 During the expedition, the team will be sharing discoveries live on the web via telepresence technology, putting the unexplored ocean directly to the vistors of the mission website. The 2013 expedition season consists of multiple cruise legs and will begin off the U.S. coast in the Gulf of Mexico. Subsequent cruise legs will bring the ship and the Nautilus Corps of Exploration to the Cayman Islands, Puerto Rico, Montserrat, Grenada and Trinidad & Tobago in the Caribbean Sea. The Corps of Exploration will also join researchers in the Mediterranean Sea off the coast of Turkey aboard the Bodrum. E/V Nautilus is a 211-foot research vessel equipped with current technology exploration and telepresence technology. The primary remotely operated vehicles (ROVs) on board, named Hercules and Argus, will be used to view the seafloor with high definition video, take environmental measurements and collect geological and biological samples. The hull-mounted multibeam system will be utilising side-scan and subbottom sonar technology to explore the seafloor and seek out targets for closer investigation and study. This process can be followed live. Dr. Robert Ballard and Dr. Katherine Croff Bell of the Ocean Exploration Trust lead the Nautilus Corps of Exploration, which includes a rotating team of more than 150 scientists, engineers, educators and students as they explore these poorly understood regions of the world’s oceans. All of the video and data will be transmitted via satellite to the Inner Space Center, located at the University of Rhode Island Graduate School of Oceanography, where Dr. Ballard is a professor of oceanography. From this “mission control,” video feeds from the ship and under the sea will be broadcast live on the internet so that anyone in the world can join the Corps of Exploration from home and be a part of the exploration as it happens. The 2013 Nautilus Exploration Program is made possible through partnerships with the National Oceanic and Atmospheric Administration (NOAA), Ocean Exploration Trust (OET) Bechtel, Sea Research Foundation, National Geographic Society, Office of Naval Research, and the University of Rhode Island.